Hi y'all, figured I'd introduce myself over here. 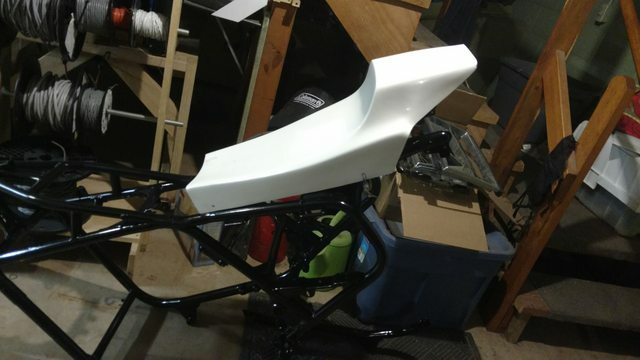 I'm about halfway through a GL1000 project that is both my first motorcycle and first bike build. I've been a car guy for 10+ years and have worked mostly on old Volvos, adding turbos, adapting transmissions, and in general making them way more ridiculous than they ever should have been. 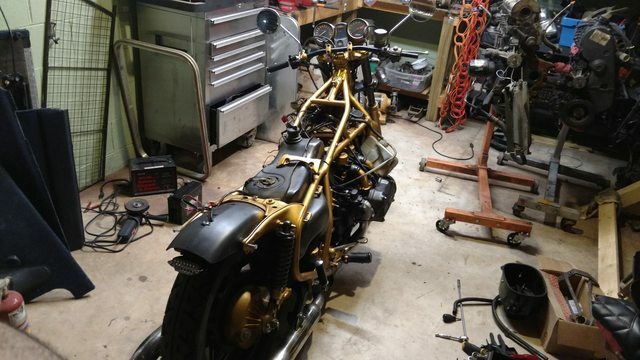 Anyway, I've been thinking about a bike for awhile, and I ran across some photos of an old Goldwing that was turned into a naked bike. I instantly fell in love. 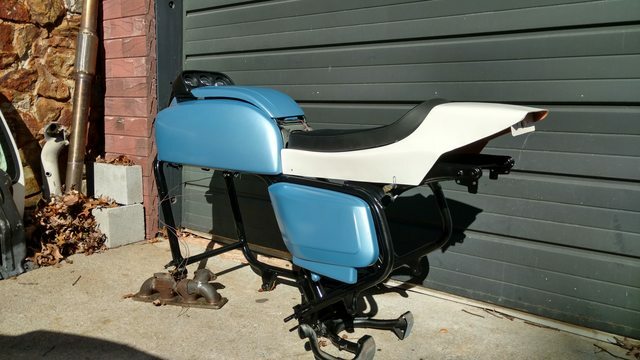 After spending some time on Craiglist, I found one down in Atlanta that fit the bill. I hooked up the trailer and drove the 2 hours south after work. It was WAAAYYYY uglier than I expected, and the guy was asking $650. I couldn't ride the thing on account of the throttle cable being broken and frayed, and it wouldn't crank for some reason. I did put it in gear and push it around to make sure it wasn't seized up. After all that, I did actually buy it. For $260. As soon as I got home, I realized it HAD to come apart. 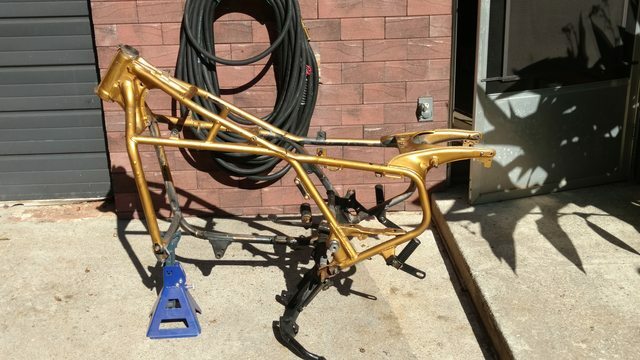 Not just to get the ugly gold off the frame, but because the wiring harness was seriously fawked. Along with just about everything else. Disassembly went by quickly, but it always does. 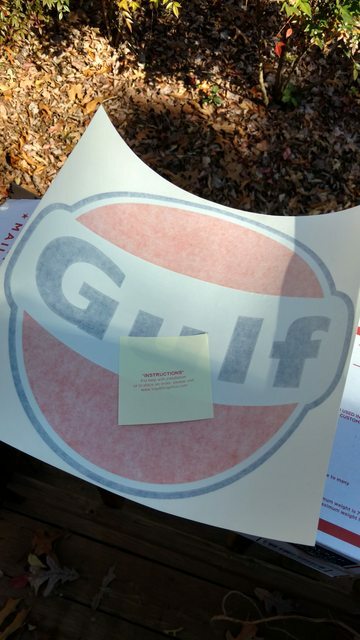 The only real surprise was a wasted steering bearing. Fixed that by applying a new set of forks. Bonus: I don't have to strip the gold off of the replacement forks. 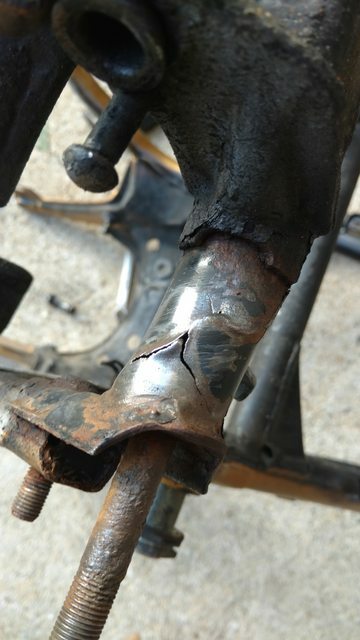 Found a little damage on the center stand tube from where it had hit something. Beat that flat and welded it back up. Spoiler alert: I shouldn't have done that. 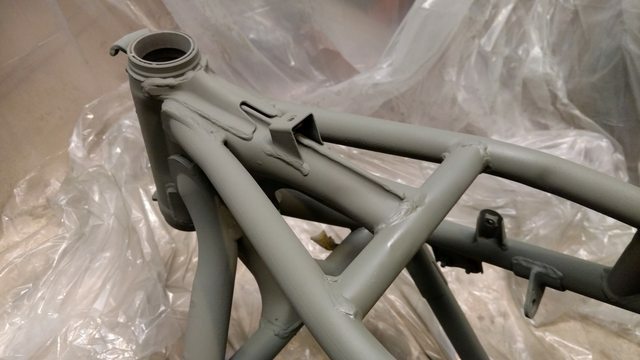 I let the paint cure for 2 weeks (both inside and outside in the sun) and it never really hardened up like it was supposed to. 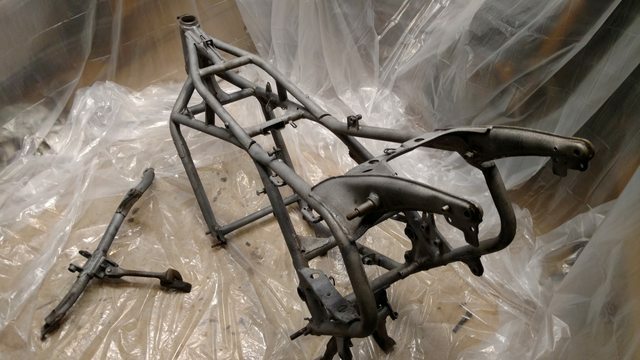 I reluctantly dropped the frame off for re-blasting and powdercoating yesterday. Going satin black this time. On the upside, the blasting media was free, and I only used 3 cans of $7 spraypaint, so it was a cheap lesson learned. Picked out a color, took the ugly vinyl off the shelter tank lid, yanked off the flaming goldwing chicken, and shaved the recess for the emblem. Bondo, sand, spot putty, sand, repeat. No clear yet, so it looks satin. 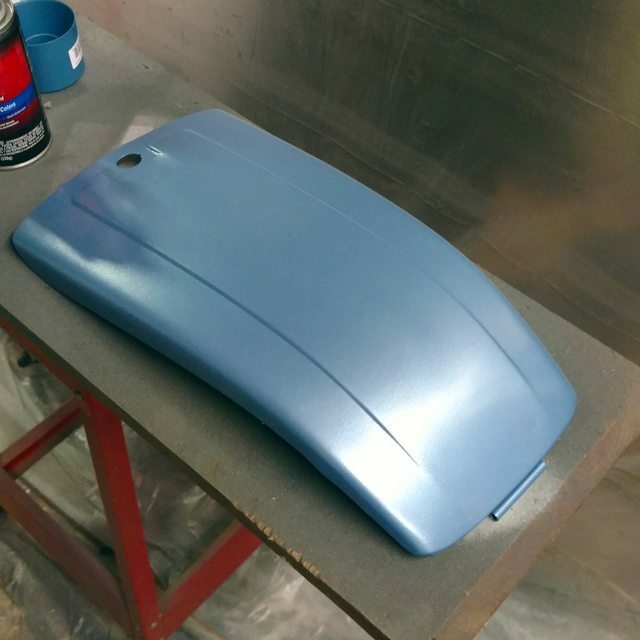 It'll be glossy after clearcoat. And couldn't resist mocking everything up in the sun. During disassembly, I noticed that the coolant level was low and there was a lot of oily gunk in the rad and reservoir. 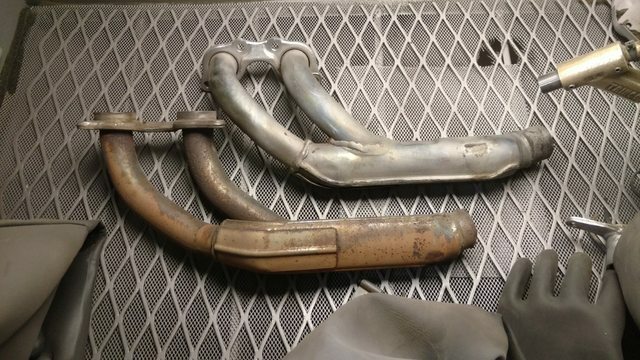 There was definite coolant smell in the right hand exhaust manifold too. Figured I should tackle the head gaskets while everything was apart...easiest headgasket job I've ever done. 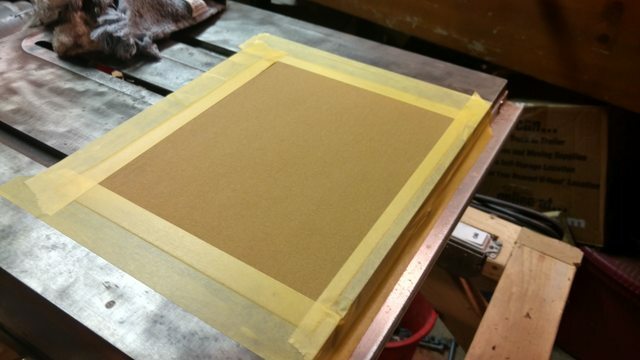 Drank a few beers while sliding the head around and wound up with a clean, flat finish. 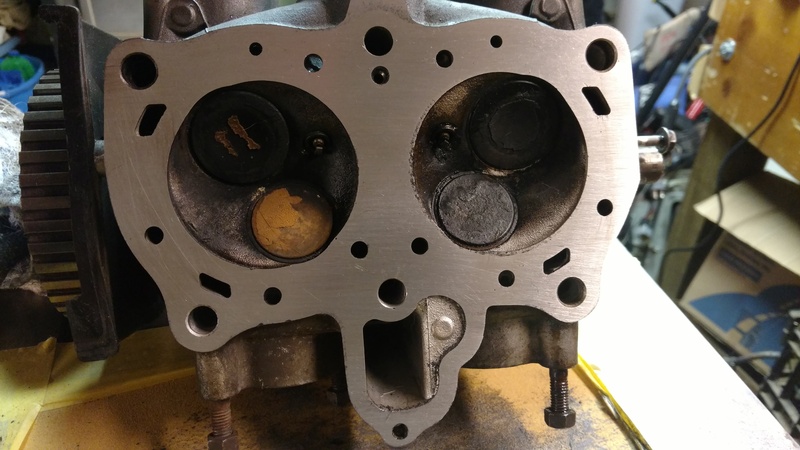 Chased the holes, cleaned the block deck (sorta), new gasket, and torqued down. Ordered some ricer-spec adjustable shocks because my stock ones were completely wasted. I guess that about gets us current. There's a lot of stuff not pictured...new fresh instruments and gauges, new wiring harness, brake pads, etc. etc. So far, including purchase price and valuing my time at $0.17/hr, I'm in this riiiiight around $1700. 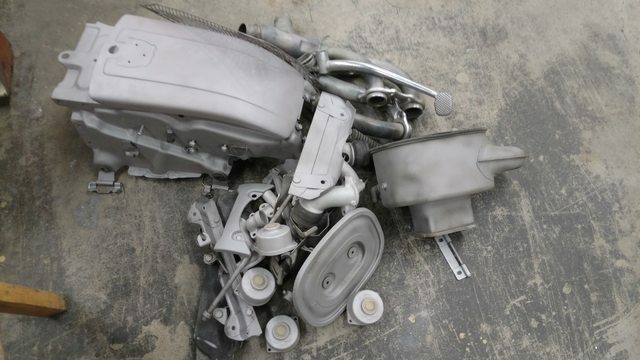 I could've spent $1,200 instead of $260 and gotten a bike that was road-ready, but I like to know what I'm working with anyway, and pulling it apart and completely redoing it lets me really understand the condition everything is in . Currently, I'm awaiting a new neutral switch, some upgraded swingarm bearings from the UK, handlebars, and a few other things. 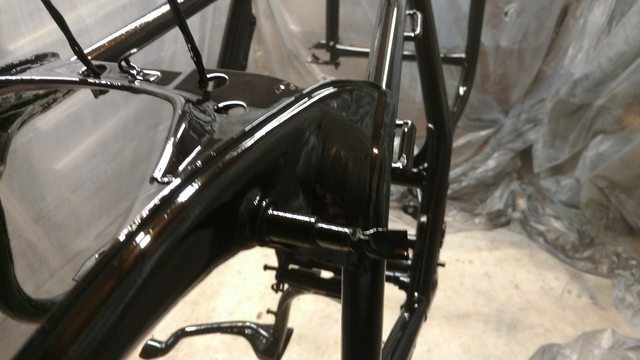 The frame should be out of powdercoat in a week or so. 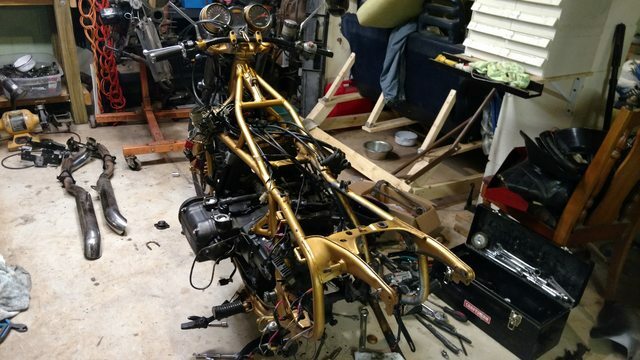 About the title...I was showing pictures of naked goldwings to a coworker and he said "wow, that could be a really cool cafe-style bike!" Another coworker turned around and said "Nah, that's waaaay too big for a cafe racer. More like a buffet racer maybe." and the name stuck. Suits me too...I'm known to enjoy a good Chinese buffet from time to time. 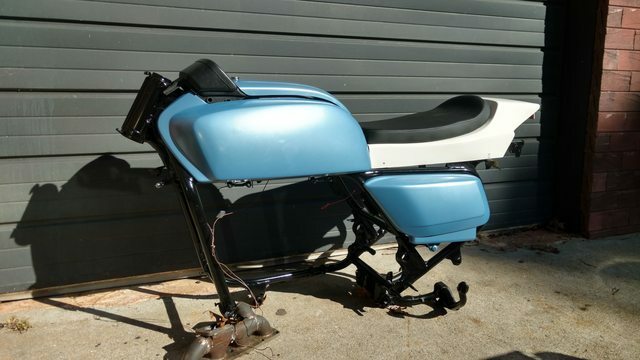 The goal is to have this thing running/riding/registered on the first day of spring. I should be able to make that deadline relatively easily. My local community college doesn't offer another MSF course until March anyway. I brought the bike home on October 13...with parts chasing and everything else, I think I'm making pretty good progress so far. Anyhow, cheers. I'll try and keep the thread updated and solicit ideas/comments/advice from y'all. Thanks for having me. Last edited by propav8r; 12-02-2016 at 12:51 PM. 540nova, K9Swine, Timbo Slice and 1 others like this. Goldwings.....even when I was little always gave me boners. I own 2 now. 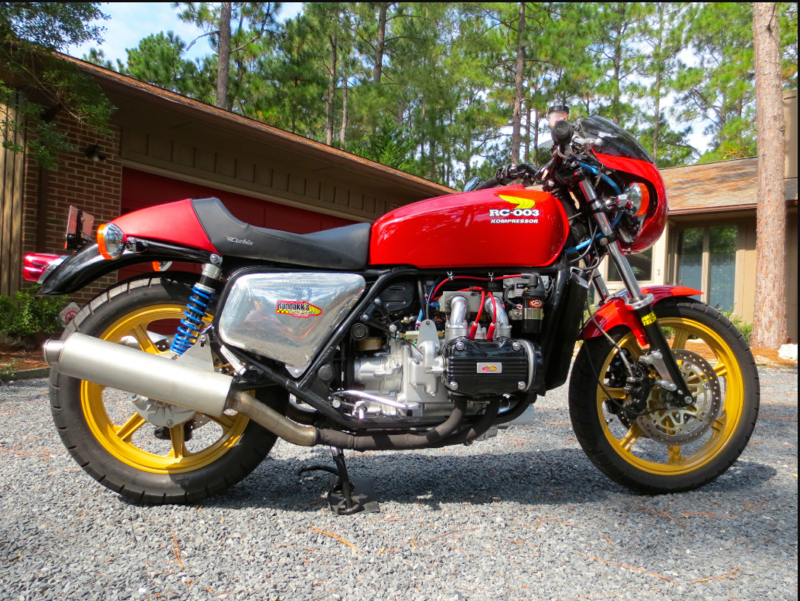 Although the Goldwing was always designed as a long range touring bike it's origins were more from formula 1 and Hondas attempt at a transverse 6. Looks like your moving along nicely. 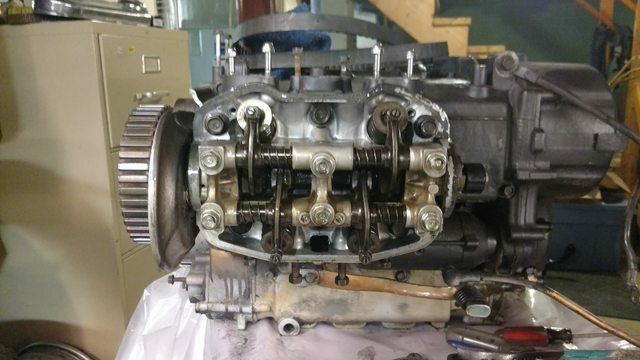 Since the motor is out I would update the charging system as this needs to be accomplished with the motor out and it has always been the Goldwings aquilies heal. The conversion might have already been done but make sure. Also the connector from the generator is another issue.......although most were recalled to repair but it wouldn't hurt to address that. The rfy shocks?.........not the worst on earth but nowhere near adequate. There's some threads here that address it's short comings and modifications to enhance their performance. 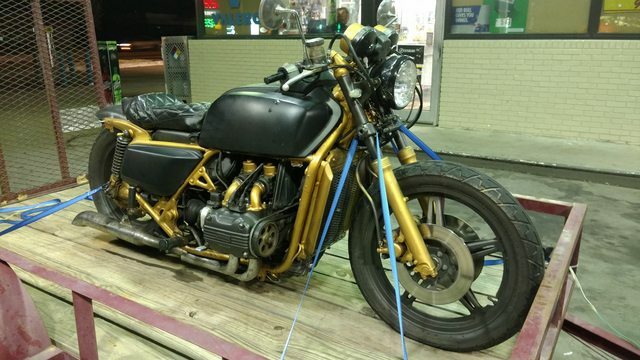 Keep in mind that ebay sellers will say it fits this model and that model but the Goldwings is heavy and behaves like a fat guy who just left the Chinese buffet after over eating. Perhaps if there's $$ in the budget a call to YSS will get you the shocks that would be setup for your application....not a blanket for one size fits all. Just a thought. I hope you have thick skin. This bike falls into the category of "There is nothing more expensive than a free motorcycle", granted it wasn't free, but dang near. The general consensus at this forum is fixing the issues and getting it to run to determine any other major faults before completely disassembling it. In the stance it sat at when you got it I would ave to agree with your coworkers, that thing would only be good to put around in straight lines, first corner you take you'll be scrapping pipes and other hard bits off. I hope you plan on raising it. Those RFY shocks were not built for a bike as heavy as a GW and are poor quality as they come, but they are cheap. 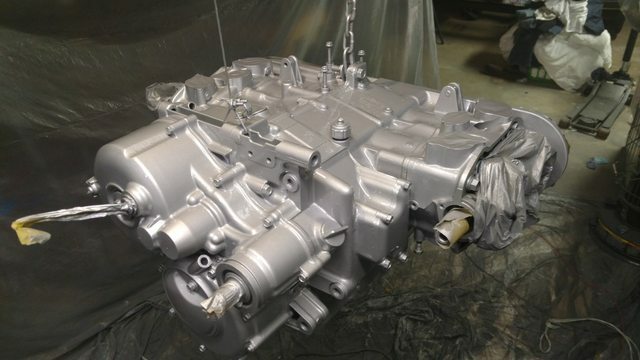 They can be sent in for rebuild and made to work properly with the correct oils and volumes. 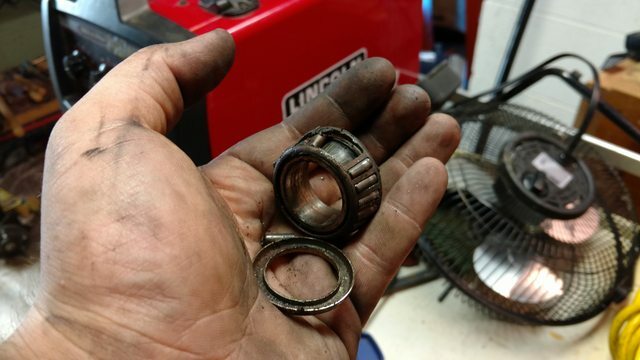 How do you fix a broken bearing by replacing forks? I've only seen 2 GW's that I would consider cafe racers. Another point. With the engine out, swap in new cam belts. A well sorted GoldWing, with a competent rider aboard, can eat the average rice rocket with flip-flop wearing rider for lunch, and poop out breakfast. Yes, they'll scrape some stuff it you aren't careful; but if a Goldwing is scraping, it's still got plenty of tire bite, and the average squid is already picking asphalt out of his pepperonis. Thanks man. 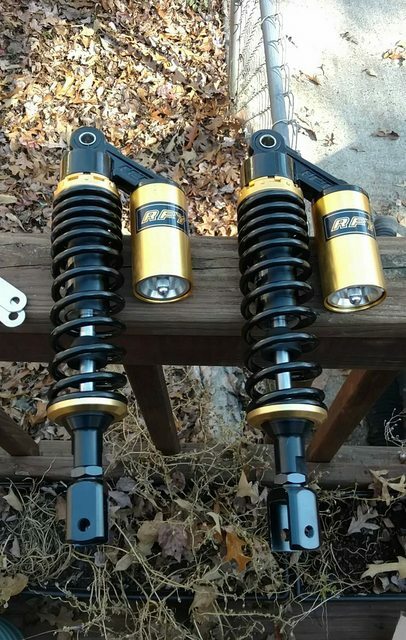 I don't expect the shocks to be track-day ready or anything, but they're slightly shorter than stock shocks and the price was right. 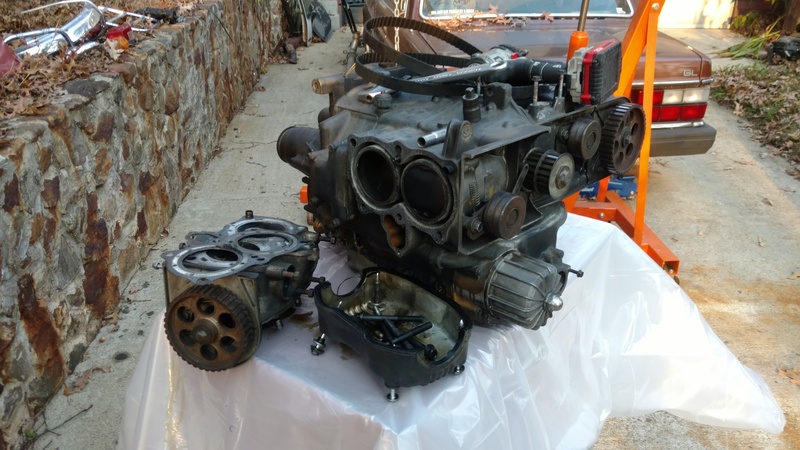 I look at it the same way as I do buying a $189 ebay turbo to get an idea of what size snail works best on a motor I built. 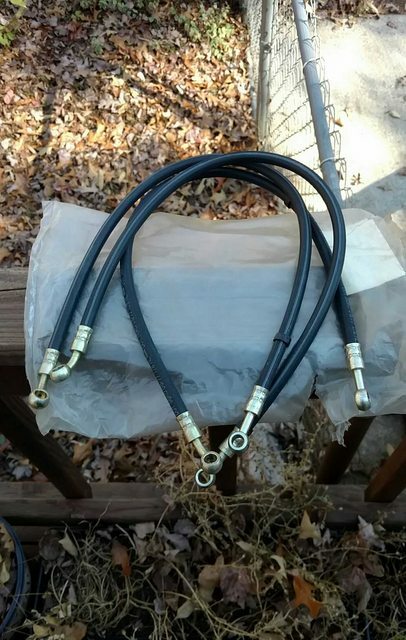 I can at least get the bike rolling with these and maybe sell them for $20 when I find something better. I ohmed out the generator and all is well. 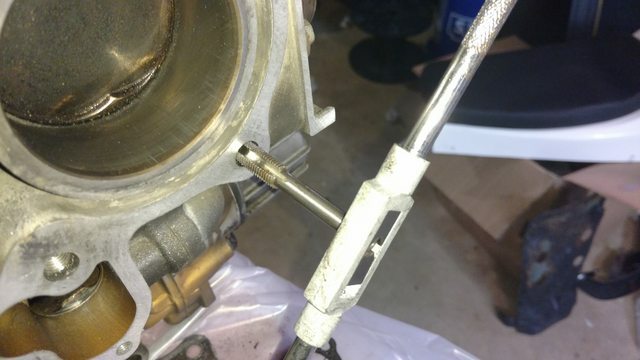 I've got a weatherpak connector kit stashed somewhere, so I'll just throw on a 3-pin and be done with it. I don't really care about expense. Sure, I'll snag a deal when I come across it, but I spent too many years building cars out of junkyards to lose sleep over spending a few extra dollars on something I want. So far, I'm at $1,700, and I don't really have any more major purchases to make. Have I spent my time on it? Sure. But I love working on crap. The "stance that it sat when I got it" was a result of having it strapped down tight on a trailer. It had more normalish ride height without the straps. The used forks I bought came with new bearings installed. The races in the head tube are fine. That's the fix. That's cool that you've only seen two. I've never even seen one. Last edited by propav8r; 11-16-2016 at 03:32 PM. Done and done. New tensioner rollers from Honda are $100+, but I found a guy who used some random Hyundai roller that fits perfectly for...wait for it...$18 each. Win. Haha, I've got some time before I'm leaning hard enough to scrape stuff...gotta learn to ride first! I shouldn't imply that I've never been on a bike, but I haven't ever owned one. Big learning curve ahead of me. 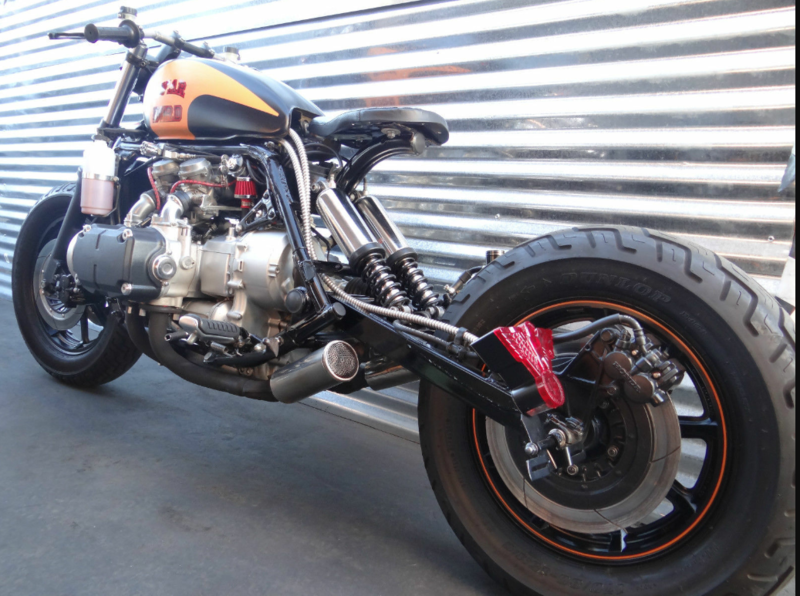 Geeto will have to post a pic of Raacks (sp) GoldWing, I couldn't find it. And I'll try and find the pic I took of the one I saw at Barber in 2009. I think your heading in the right direction from what you started with. 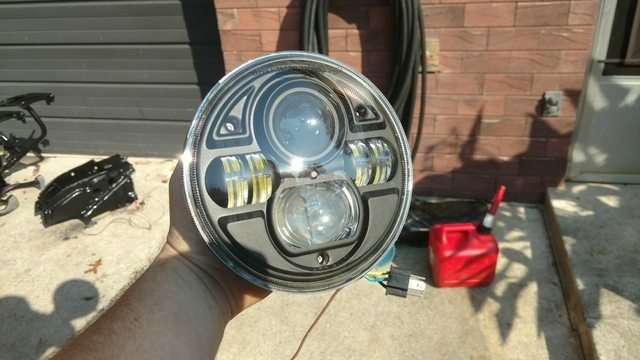 Get ahold of me when you're ready to take $20 for the RFY's I could use them after they're rebuilt. When learning to ride keep the thought in your head that everyone else on the road is out to kill you and ride accordingly. This one described in Spanish is "caca"
This one looks like a fun and fine runner. If you can't pick it back up, don't ride it.